K7 AntiVirus is home-user friendly virus removal software which protects your PC from viruses, trojans, malware and spyware. K7 Anti Virus Software features include automatic updates, real-time scanning, email scanning and spyware protection with an enhanced scan engine to protect you PC. K7 AntiVirus is home-user friendly virus removal software which protects your PC from viruses, trojans, malware and spyware. 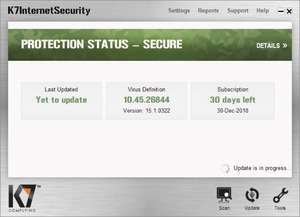 K7 Internet Security 15.1.0323 is a shareware program and can be used as a demo to try the software until the free trial period has ended. A full version of the program is available after the trial period ends. For security reasons, you should also check out the K7 Internet Security download at LO4D.com which includes virus and malware tests. Additional screenshots of this application download may be available, too. K7 AntiVirus Plus has a presence on social networks. K7 AntiVirus Plus download been highly rated by our users.